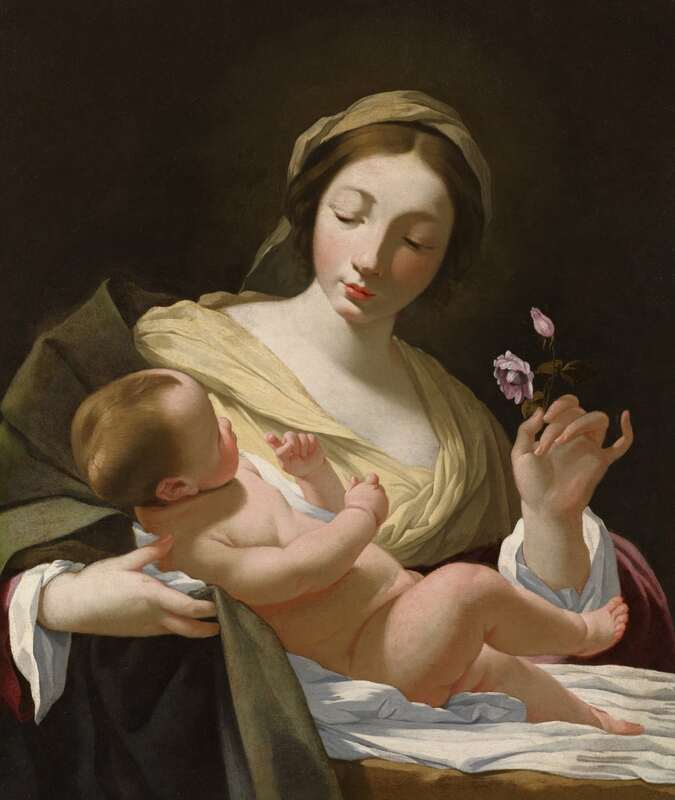 The Virgin and Child held particular fascination for Simon Vouet, the French painter and draftsman who today is perhaps best remembered for introducing the Italian Baroque style of painting to France. No less than twelve paintings of this subject by the artist were engraved, of which seven are dated to within Vouet's lifetime, and five to shortly after his death. Vouet clearly relished the contrasts he rendered in his Virgin. Here, the lemon yellow of her headdress and shawl highlight the idealised alabaster pallor of her skin. At the same time, her cheeks and fingertips are rosy with maternal tendresse and fervour, and the rose itself is in purposeful harmony with the blush of her face and the Christ-child’s convincingly life-like, wriggling pink body. In his choice of colours, Vouet conveys subtle artistic oppositions, achieving climax in the sensual body of the Virgin herself – an allusion to her passionate yet pure love of Christ, while also a Renaissance interpretation of idealised corporeal female beauty. A renewed level of devotion to the Virgin was evident in France in the 1630s; indeed, in 1638, the year the prime version of this painting was first painted (now in the Musée des Beaux-Arts, Marseilles, illus. above), King Louis XIII dedicated his kingdom to the Virgin. In addition, there was a growing passion for the devotion of Christ as a Child, following the birth of the Dauphin in 1638. The subject was thus greatly in demand from artists of the time, and the success of Vouet in producing small-scale, half-lengths of the Virgin, intended for a private clientèle, was assured. His Virgin and Child 'à la Rose’, is regarded as among the aritst’s gentlest and most beautiful paintings, and is securely dated to the period 1637 – 1638. Our painting, presumably painted some time shortly after 1638, is one of several known versions overseen by Vouet in his by then extensive studio, to meet the demands of his numerous noble patrons. Nonetheless, it was already a subject with which Vouet had long been artistically preoccupied. In 1626, at the height of his early fame and in the final year of his stay in Italy (which began in Venice in 1612, settling in Rome in 1614), he married fellow artist Virginia Vezzi (1601 – 1638). During the succeeding months, as the aptly named Virginia expected their first child, Vouet became preoccupied with painting the Virgin and Child, with his wife as the model for the Madonna. He painted The Apparition of the Virgin to St. Bruno for the Certosa di San Martino in Naples, while his Holy Family with St. John the Baptist (Museum of Fine Arts, San Francisco), was painted for Cardinal Francesco Barberini (1597 – 1679) towards the end of that year. Despite his success in Rome, Vouet returned to France in 1627, following pressing recommendations from the Duc de Béthunes and a summons from King Louis XIII to become ‘premier peintre du Roi’. His new style was distinctly Italian, though very much adapted to the grand decorative scheme of the era. Louis XIII commissioned portraits, tapestry cartoons and paintings for the Palais du Louvre, the Palais du Luxembourg and the Chateau de Saint-Germain-en-Laye. In 1632, Vouet worked for Cardinal Richelieu at the Palais-Royal and the Chateau de Malmaison. In Paris, Vouet was the fresh dominating force in French painting, producing numerous public altarpieces and allegorical decors for private patrons. His sizeable atelier or workshop produced a whole school of French painters for the following generation, and through Vouet, French Baroque painting retained a classicizing restraint from the outset. The artist’s early Roman works had exemplified his keen interest in the Caravaggesque movement as revisited and popularized by Manfredi in the so-called manfrediana methodus. However, he increasingly became attracted to the work of Ludovico Carracci, Guido Reni, Guercino and Giulio Cesare Procaccini. These influences are particularly apparent in the present painting, with its sophisticated use of a cooler palette of white, blue and mauve in play with flashes of gold and the blush-tones of the Virgin and Child’s skin. The Virgin’s perfectly oval face recalls Guido Reni’s idealized feminine faces, while the sculptural quality of her figure echoes the work of Guercino. Alongside Valentin de Boulogne and Nicolas Poussin, Vouet was the principal French painter to work in Italy during the second and third decades of the 17th century, later becoming the chief artist of the French court from 1627 until his death in 1649. Although the blue pigment is somewhat degraded in our painting.